Problems with claims of party convergence in Australia – Thoughts on politics, policy and parties. (Some of the graphs in this piece came out a little odd – mostly too larger. apologies, I can’t quite get them to look right). Last week, Ben Reilly wrote a compelling piece on party convergence in Australia, arguing many of the problems identified with contemporary politics in this country could be explained by describing our parties as election-motivated. In this view, the parties exist to win government, with policy considerations coming a distant second (if they matter at all). However, evidence for systematic convergence is largely absent. Instead, it may exist for particular issues which are perhaps noticed more by those whose favoured issue is not on the agenda of the major parties. There is however plenty of evidence for party difference on issues, voters also appear to think the parties are different and there is a stronger theoretical basis for believing parties would pursue different rather than convergent policies. Why do some commentators believe there is no difference? There are a few possible reasons. One might be the parties do move towards the centre on some issues. Perhaps commentators pay more attention to these issues than those the parties have held more extreme positions on. Commentators may do so because this convergence is interesting, or that commentators care about these issues themselves, or movements to the centre by the parties disappoints party activists who express frustration to commentators, who then overestimate the actual level of convergence. Voters appear to recognise these differences. As political scientist Murray Goot explains, survey data indicates most Australian voters distinguish between political parties at the national level and care about the outcomes of elections. The proportion of voters perceiving a difference between the major parties has actually grown in recent decades, rather than declined. For instance, the 1967 Australian National Political Attitudes Survey found 30% of respondents believed there was a good deal of difference between the parties, compared with 21% who said there was some differences, and 38% not much difference. The 2010 Australian Election Study found 27% of respondents said there was a good deal of difference between the parties, 45% said there was some difference and 27% not much or no difference. Percentage of voters with an opinion who recognise difference between the major parties, 1946-2010. Each point represents the percentage of survey respondents who said yes to (variations on) the question “do you think there is a difference between the Coalition and Labor Party?” Trends are smoothed using LOESS curves. Data for the years 1946-2001 taken from (Goot 2004: 65). Data for 2004-10 sourced from the Australian Election Study by the author. This perception of party difference may be grounded in real variation in the policy positions and agendas of the parties. Examinations of the issue preferences of Coalition and Labor Party candidates by Ian McAllister and Simon Jackman found significant differences between the two; indicating parties may not only be run by election-motivated individuals, but by those concerned about policy outcomes. Examinations of party election policies also show that in almost every federal election since 1946 the Coalition and Labor Party have made very different promises during the campaigns, with Coalition promises to the right of the political centre and Labor promises to the left. Another study that looked at Governor-Generals’ speeches also showed ongoing differences between the agendas the parties outlined at the beginning of their terms in office. 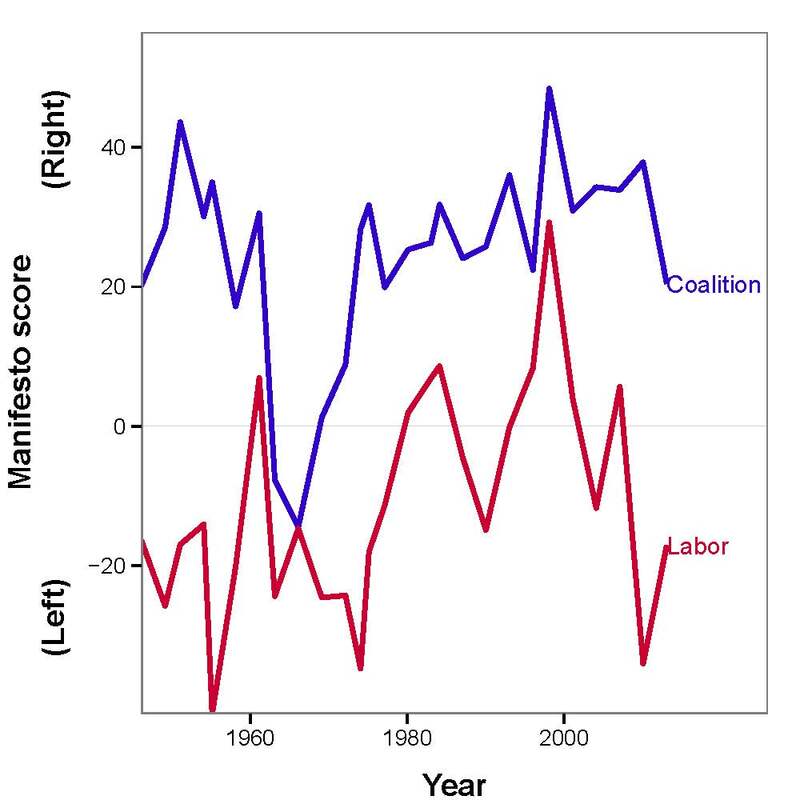 Left-right position of party policy promises during Australian federal elections, 1946-2013. Each curve represents the left-right score of Coalition and Labor election promises (from -100 to the left to +100 to the right) for each Australian federal election. Party scores were sourced from the Manifesto Data Collection. Coalition positions were calculated by the author from constituent party scores weighted by their proportion of the first preference vote. Parties don’t just promise different policy outcomes, either. Looking at public policy developments that have occurred in Australia over the past six and half decades, it would appear they tend to deliver, at least on economic matters. Coalition governments in office from 1949 to 1972 rejected the concept of an expanded welfare state, with overall federal social expenditure declining as a percentage of GDP over this period; as Australia enjoyed the debatable distinction of being one of only two OECD countries in which public income support expenditure as a percentage of GDP declined during the 1950s. The Whitlam Labor government, in office from the end of 1972 to 1975, introduced an ambitious agenda that rapidly expanded government and involved large spending commitments; whilst the following Fraser Coalition government (1975-1983) proceeded to attack big government and public sector spending, although its efforts did not satisfy all of its supporters. These differences have continued into the current political period. The Accord between the Labor Party and the union movement — which linked a reduction in wage increases with the introduction of a new social wage, including universal health insurance —can be seen as a classic Labor policy which sought to plan the economy for the benefit of the working-class: aiming for full employment, increased welfare provision, and industrial revitalisation. Klingemann, Hofferbert, and Budge observed that in particular, between the 1940s and 1980s Coalition governments de-emphasised spending on welfare compared with the Labor Party. Differences in the taxation policies of the Howard led Coalition governments from 1996-2007 and the Labor opposition of the time were also identified by journalist George Megalogenis. Policy differences in recent years have included views on using a carbon price to reduce emissions (although like most complex issues, party positions have varied), on industrial relations, and the use of countercyclical public spending to reduce the impacts of recessions. The first budget of the Abbott Coalition government was also acknowledged as being ideological in nature by at least one journalist, with its overriding goal identified as being to reduce the size of the Commonwealth government, and its impact falling hardest or low and middle income households. The idea of convergence, as Ben Reilly described it, relies on a number of possible theories. Downsian spatial models assume there is an electoral benefit by moving to the political centre. This can lead to catch-all parties that try and win broad based support, or cartel parties that embed themselves in the state and use public funding to stave off challengers. An alternative view is the end of ideology theory. This assumes growing affluence has resulted in economic class and issues of redistribution have become less meaningful in a modern (post)industrial society. The latter views the increasingly affluence of modern society as reducing the salience of economic cleavages. 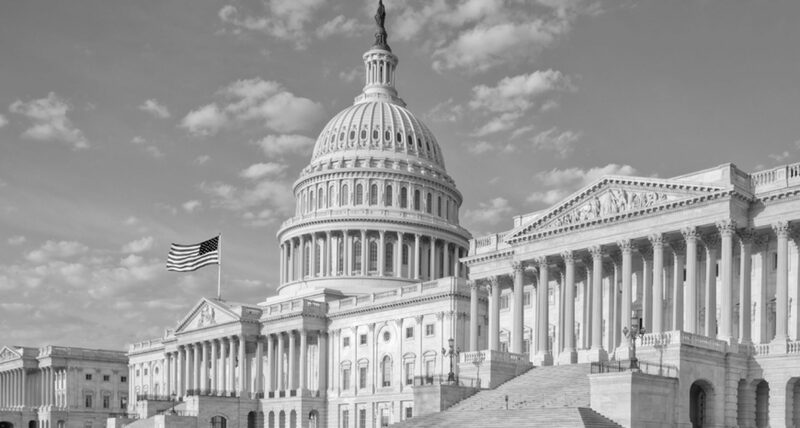 The former sees party competition and the desire to hold office largely for the sake of the benefits that can be accrued from being in government as the primary motivation of parties; and is the primary theoretical basis for Ben Reilly’s claims. Even in circumstances where the primary assumption of the median voter theorem is correct and electoral benefits may be obtained by parties moving towards the political centre, there may be equally important reasons for parties not to fully exploit these gains. We might expect parties to not be made up of only election-motivated individuals, either; but also issue-driven candidates and officials who care (at least in part) about winning office not simply for the sake of obtaining the spoils of government and incumbency, but also to achieve certain public policy outcomes. We know the types of people that represent the Coalition and Labor Party in parliament come from different occupational backgrounds, even if the gap has declined in recent decades. We also know the parties represent different types of voters: the Coalition’s supports being more likely to be older with higher incomes; and Labor’s with a higher probability of being younger, lower income union members. This is reflected in the sources of party donations. The Labor Party relies heavily on the support of trade unions for financial support. According to Ramsay and McMenamin The Coalition’s support base is more heavily reliant on corporate interests for donations. 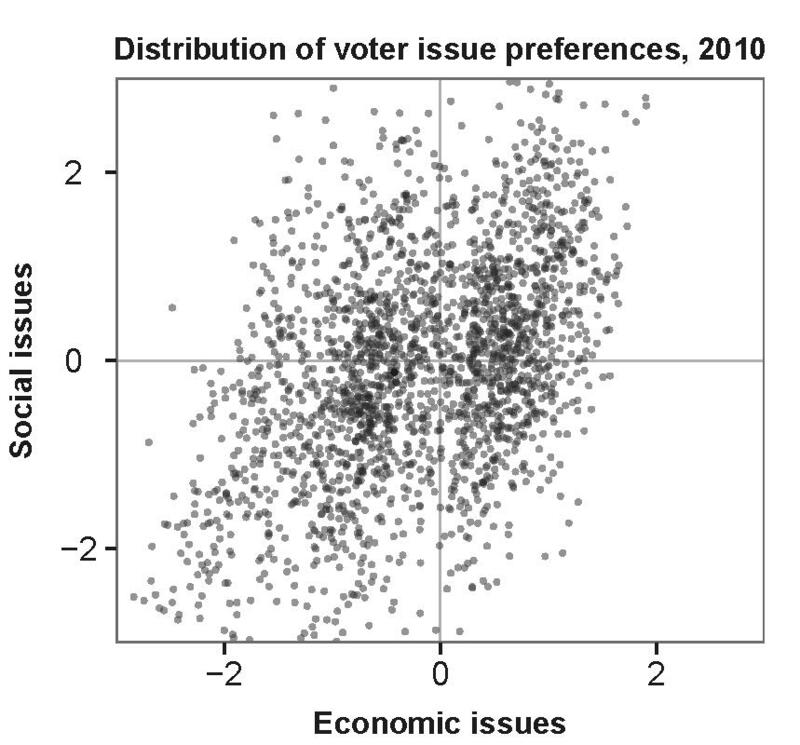 However, we also know most voters have issue preferences clustered near the political centre (as shown below). As a result, the median voter theorem is probably correct that there might be some electoral benefit to be gained from moving towards the middle on at least some issues. However, in the years and months before the next election, when parties make policy decisions, the position of voters on issues and how they will react to party announcements, is only known with uncertainty. Voters’ will also be able to locate the positions parties take on the issues with uncertainty (sometimes mistaking what a party’s actual position is). This limits the benefits a party can gain from moving towards the centre. Left-right position of Australian voters on economic and social issues, 2010. Each point represents the issue preferences of a voter (with a negative score reflecting a left-of-centre preference and a positive right-of-centre, and zero a position at the electorate mean). Scores were calculated by the author from Australian Election Study data. We can therefore understand the behaviour of parties who are composed to some degree by policy-motivated actors by assuming parties, their officials, supporters and candidates care about obtaining their preferred policy outcomes, but not at the exclusion of winning elections. Instead, the two are complimentary: elections must be won for policy platforms to be implemented; but if a party compromises its policy position too much to win (by moving too close to the centre), it gains very little from winning in terms of policy outcomes. As a result, we can view Australia’s political parties as constantly attempting to find the policy position between their ideal policy point and the preferences of the median voter; providing the optimal trade off between winning elections and having the opportunity to enact their policy agenda (see for instance Wittman 1983). This movement by the parties towards the centre on some issues may help convince some voters and commentators that they are more centrist then they actually are. By signalling their centrist positions on some issues they believe it is important to move towards the centre on, the parties may over-emphasise their convergence. 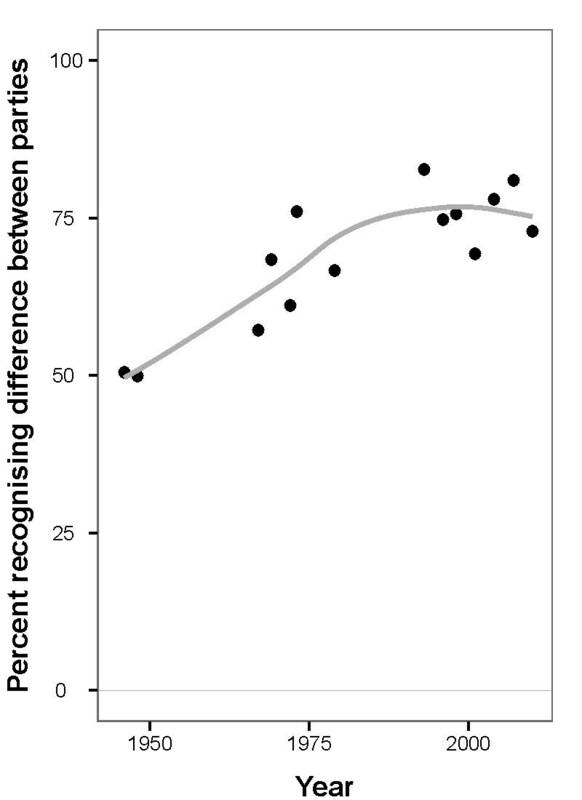 This may make an over-estimate of party moderation understandable. However, to focus on these issues in isolation ignores the large number of issues they may have held an ideological position on to maintain the utility of an election win. How can we view the Abbott Coalition government’s actions in light of these ideas? It does appear to be true that the recently announced federal budget for the 2015-16 financial year was a move to the political center, dropping some contention and perceptually ideologically extreme positions (such as the GP co-payment). However, this needs to be acknowledged as a move away from the previous budget, which was generally acknowledged as being ideologically extreme and unpopular. The move to the right in the first budget and to the centre in the second actually fits with the model presented above: once it won office the Coalition attempted to obtain policies close to their preferred positions (reducing the public subsidy for industry, medical care and higher education). However, realising (belatedly) that these policies were a long way from the preferences of most voters, the government has moved back towards the centre (but not on all issues – for instance higher education); trying to find the equilibrium between their preferred position and that of the median voter. As parties represent different groups of voters, parliamentarians and financial contributors, we should expect they will represent different policy constituencies. However, to obtain the public policies they want, we should also expect (and hope to see) the parties compromise on some issues. They cannot achieve anything if they do not win government. As a result, we will continue to see the parties move towards and away from the political centre as they search for the sweet spot between what they want and what the public (on average) wants from government. In particular they will sacrifice issues that do not necessarily matter to their core constituencies (asylum seekers for the Labor Party, anti-discrimination law for the Coalition) that may matter to some of their supporters. This does not mean the parties are the same. It just means they (like all of us) are sometimes forced to sacrifice and compromise to get what ultimately matters to them the most. A very interesting piece. I just finished reading Stephen Mills’s work on campaigning in Australia whose take home message can be summed up as ‘‘produce a product people want’. So it could be the case that while party’s policy offerings remain focused on their ideological messages, the way they communicate with us — given they are both using very similar types of research techniques, is what is similar. They are both trying to work out what we want and to present to us slightly different versions of what we want, which would naturally then appear the same. This might not be what they actually then deliver, which is what your work is showing you is the case. What you write all sounds reasonable and correct. You also need to seperate valence and position issues, though. A great deal of what the parties talk about (higher economic and income growth, lower unemployment and inflation) are valence issues, and pretty much everyone (and the two major party groups) largely agree on these. Neither party has much control over how they are viewed by voters on these issues (beyond trying to look competent, which both will do). It’s position issues (higher social spending or lower taxes, more or less workplace rights for employees) which the parties (and their activists and voters) tend to disagree. It’s on these they can (somewhat) move their position around to try and maintain competitiveness, but which they are constrained by the policy-motivated within the party. Yes that is the case, but the parties certainly put a lot of effort into trying to get political debate to be about their issues and they are self aware enough (usually) to know which of their issues are better to highlight (eg. Carbon Tax for Coalition/ Education reform for ALP) and which ones to run dead (IR Reform/ government debt). They are also in control of how much detail they release about their policy positions. I guess what I’m saying, is that, if the parties aren’t actually converging as we like to say they are and as many people believe they are, why do we believe this? Are the parties doing something different themselves or is it just that we don’t have the Cold War anymore to cast the differences between the parties in stark relief? That assumes the claims of convergence are new. They’re not. There were claims in the late 1940s, at the height of the Cold War in the 1950s and 1960s, as well as during the 1970s, ’80s, ’90 and the 2000s. Every decade there’s been someone who has claimed there is no difference between the parties, for one reason or another. what are the nature of the claims though? Are they saying that the parties are the same or that they are getting more similar? Sorry, just saw your reply (me good at blogs). Others, such as van Onselen, would at least say issues/ideology are less important than they once were. I think Jaensch could be said to be taking a similar position. *Apologies if I am misconstruing your claims, Ian. Previous PostPrevious Did Malcolm Fraser briefly shift the divisions of Australian politics?